Yesterday was strangely cold. And rainy. Yet I headed out in my shorts and tee shirt to run a few errands. It isn’t lost on me that most everyone is bundled up in a winter coat. I hate layers of clothing. And I run hot. If I’m sitting I might get cold. But moving around? I just really don’t feel the cold. Been that way all my life. I do get strange looks. One errand was to stop at Lowes in Tulsa Hills, where I picked up a cleaning brush to clean my shower tiles. They had empty spray bottles on sale for $2.95 each, so I grabbed two. I’ll use one for a vinegar recipe to clean those bathtub tiles. And the other to mix up a recipe for garden bugs. Then as I’m driving down the parking lot to Target and come to a stop sign, I pause to look at my receipt. I was charged full price for the spray bottles. Shoot. I warred with myself. It was less than two dollars. Still I turned around and went back. I hate the customer service area in stores. It is there that you find aggravated people who didn’t get what they thought they purchased. Or it broke and they want their money back. The guy had me go find the actual price for the spray bottles, and then after that I had to stand behind a woman while she got her refund for something. Which had me kicking myself. Here I was standing on my ankle in pain over less than two bucks. Live and learn. Sometimes getting the deal just isn’t worth it. The golden pennies came back in the driftwood from last year. I didn’t make it to Target. I knew I didn’t have much standing/walking time left in me, and I needed some things at the grocery store. I love my grocery store. It’s called Reasors. It has a section of freshly cooked foods. I can buy three days worth of very tasty brisket for $9 or under. I heat it up in my Breville Smart oven and it is mighty good. I figure three bucks for the main part of my meal is pretty good. I will cook some potatoes and some other veggie to have with it and that will last me three days as well. I figure it’s a good deal for someone like me who can’t stand an inordinate amount of time on my feet cooking. No matter how my day goes, I know the main part of the meal only needs heating up at the end of the day. 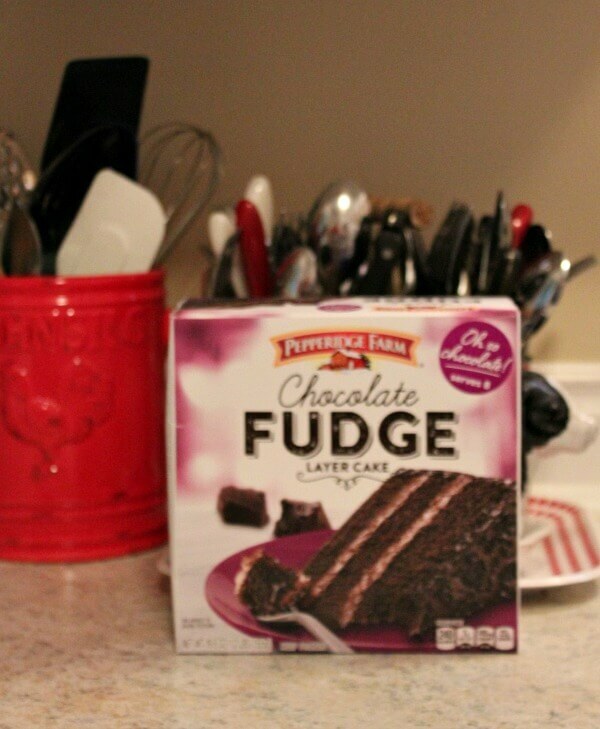 Another thing I’ve been buying are the Pepperidge Farm frozen cakes. They come in chocolate and lemon and coconut and a few other versions. But I prefer the chocolate. They’re usually in the the $3 range, but lately they’ve been on sale for under $3. Sorry about the photo being blurry. It’s dark in here due to the rainy and overcast weather. Anyway, I cut off one frozen slice half an hour before I want to eat it, and it’s as good a piece of chocolate cake as I’ve ever eaten. Consistently. Plus it will give me a good ten days of nightly snacking. I’ve also been eating a lot of veggie burgers. They’re in the frozen food aisle too, and are quite good with a couple of slices of fresh tomato, mustard and pickles. Yum! Oh, and baked beans. A funny thing happened on the frozen food aisle in the grocery store. An elderly woman was fussing about finding something and a clerk was helping her. 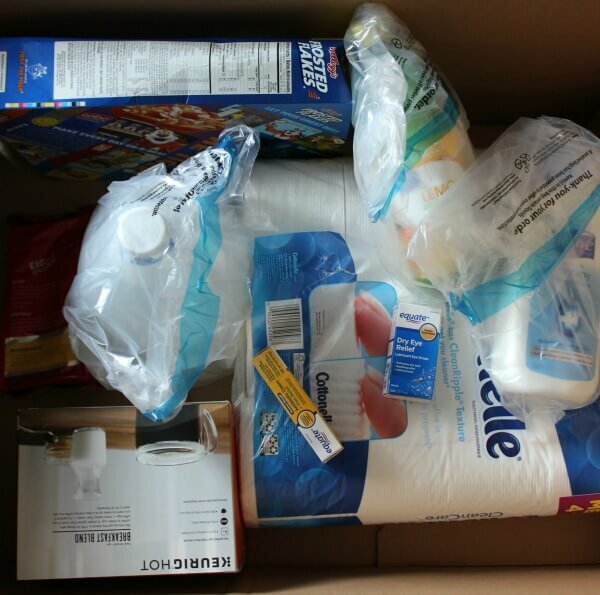 Another frugal and easy alternative to shopping and standing in line is shopping Walmart.com. Here’s one shipment that just came. Walmart gives you free two day shipping over $35. And no standing in line. A good alternative to the brick and mortar store. I wish I was brave enough to go green and not buy paper towels. I thought about going that route. But paper towels just make my life so much easier. Here’s a tip a plumber gave me about five years ago. He was cleaning out my septic line, and asked me what kind of toilet paper I used. I told him I liked Charmin. I’ve bought Cottonelle ever since and I haven’t had to call any more plumbers out to unstop a toilet. That’s a frugal tip too. Plumbers aren’t cheap! I’m still tired from planting earlier in the week. Once I get going it’s hard to stop. I just want it done. As I’ve mentioned, I like to go out multiple times a day, usually with the pupsters, and stare at every single flower and plant. It gives me great joy. Until I see Abi jump into a container and break a few flowers off. Then Charlie follows her and there go a few more. This didn’t seem to happen last year, so I don’t know what’s going on in their little doggie minds. But it’s pure aggravation. Every time a bloom bites the dust, I see dollar signs in my head headed into a virtual trash can. In summation, think long and hard before you go back inside a store to save a dollar and change if it increases your pain level. It just isn’t worth the aggravation. I love little frugal tips. As I've said before, I'm the girl who will quibble over a dollar on some things but splurge on others. We have to do that though, right? Your Pepperidge Farms cake reminded me of my aunt and uncle who are long passed. They loved PF products and we always had them at their house. Thanks for the sweet reminder. I tried these cakes maybe a year ago and have been having a nightly slice ever since. When I get onto something, I eat it until I'm sick of it! I know what you mean about having to collect the coupons, sale items and then having to monitor the checkout clerk to make sure it's done right. I would have gone back, too; otherwise, I'd be annoyed about losing the two dollars all week. Those small savings add up and it is worth it. Customer service is fading fast. If I'd foregone the less than $2, I might have made it to Target and gotten some things there that are cheaper than the grocery. Although if I shop the grocery store sales every week, I do pretty well. Great read. I can relate to many of your dilemmas. Are those really good spray bottles? I use them for many things, and it seems like they all leak at the sprayer. Also, I love Pepperidge Farm cakes, too! If you like pie, Marie Callendar's are better than homemade! If you have a Kroger's, they have them on sale occasionally. We love the coconut, and the French silk is also very good. There are fruit ones and several other varieties as well. 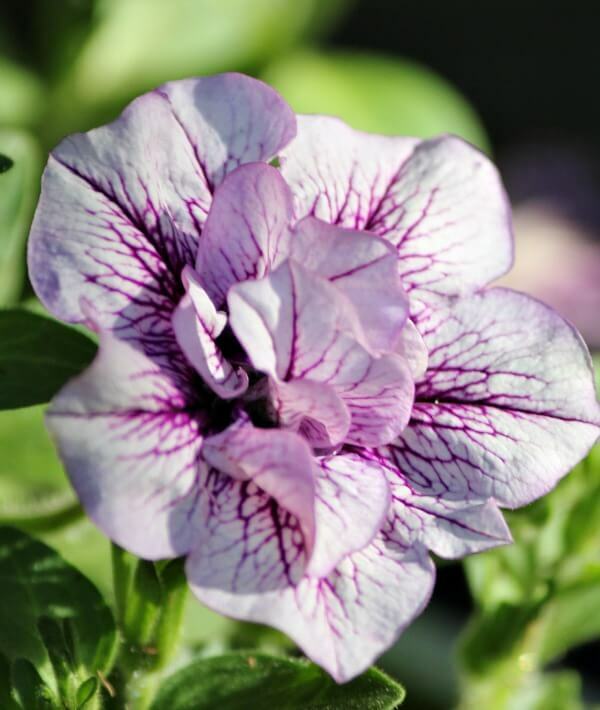 And a final suggestion…when the Pupsters attack your plants, take the flowers they break inside and make a little bouquet. At least they won't go wasted. It they're too short for a vase, float them in something. My grandson likes to bring me little offerings, and I have a teeny vase that I put them in. Love and hugs to you on a weird weather day! I followed your advice and brought two flowers in today the pupsters butchered with their feet. These spray bottles seem pretty heavy duty to me. Not like the cheap ones. Your story about getting charged the regular price on a sale item reminded me of a shopping trip I went on recently. First to Sears, spotted a nightdress for $10 original price $17, yes you guessed it I was charged $17, luckily I spotted it straight away and it was corrected. Then on to Pier One to pick up a gift and a few other things, didn't notice until I got home but again I had been charged regular price for a sale item! I did go back the next week and pointed it out, there was no apology, the clerk just said 'yes this happens some times, its because some of our merchandise has the amount in American dollars (I live in Canada) what this had to do with it I don't know, anyway I did get my refund. I should have looked at my receipt. My fault. It's such a hassle to go back in though because I had to go find the real price. I often go back if I find it before I go home or if I go to the store frequently I'll take it back next time. Usually the sale price is why I bought something so I want that price. But I do understand the pain factor in your decisions. Hard not to be able to do all you want. Love your frugal tips! I like the cake idea!! I shop the sales as well. I've found my grocery store has pretty good sales. Like 4 cans of veggies for $1. And I can spread one can of veggies into three or four nightly meals. I try to be as frugal as possible with my shopping and only make as few trips as possible too. I always stock up on sale items. That cake looks good, I have to give that a try. I won't even get in the car until I have at least three errands. Which is why I have just under 44,000 miles on an 11 year old car. I always order from Walmart.com – it saves me time and aggravation, plus the products are so much cheaper than in my little mountain top market. I order my paper products (I use Scott TP because it's septic safe!) and laundry detergent, dishwasher detergent, etc. all through Walmart. And cereal for my sweetie, since it's $2 cheaper per box than the prices in our local market. So every time I'm placing a Walmart order for me I order 6 boxes of his cereal. And when he's off the mountain at Costco he picks up things for me. It's a good deal! I'm sure glad you told me about that big pot for my rose that I ordered from there. My daughter went in and picked it up for me, so I didn't have to walk to the back of the store for it. Walmart is trying to beat out Amazon.com now I think. I just loved this post. 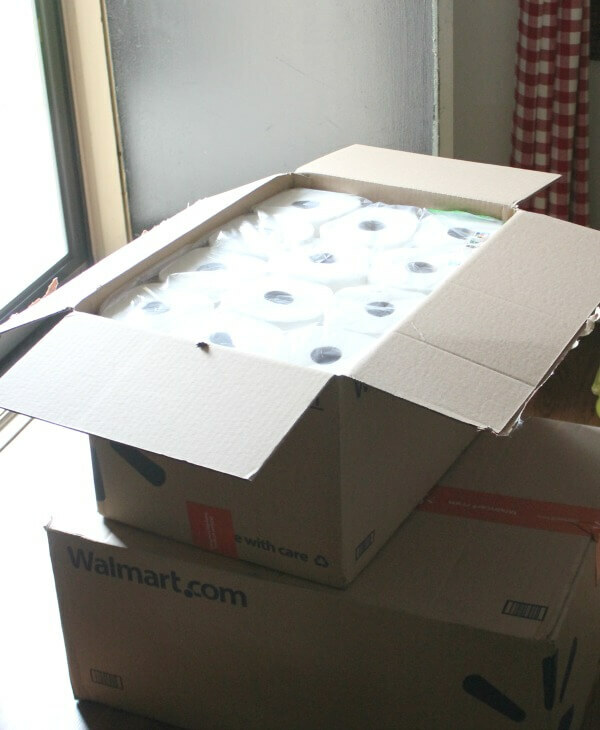 I will have to try the Walmart website, it would be nice to get these items shipped to me free and not have to haul them up in the elevator and down the hallway. Thanks for a great idea. Absolutely! That would sure help you out if they'll bring it to your door. Hi sister, I order many things online from WalMart. Pet products, paper products, etc. Plus, the selection is much better than on their store shelf, and I don't get mad if they're sold out of something ~ not a problem if ordering online. I even save money sometimes when a product is a bit cheaper on the website! I just now figured out this was you, Marietta. Guess I didn't read it close enough the first time around. Miss hearing from you! Customer Service seems more like Customer Hassle. It's awful that YOU had to go track down the correct price yourself, rather than a store employee doing it! On the subject of paper towels, I don't think you should feel guilty for using a perfectly legal and acceptable product. You have limitations in doing your laundry due to your washer/dryer combo thing, and if you had to constantly be dealing with what to do with a bunch of dirty cloths until washing day, then that would be a big hassle. Also, there are some instances where paper towels simply are the best tool for the job. In my house, it's cleaning up after cat messes. No way am I going to clean up cat throw up or worse with a cloth rag. I do not want to have to deal with rinsing and cleaning out that rag. And this comes from someone who gladly coped with rinsing and washing cloth diapers for two kids! Some messes are easier to handle than others, I guess. Everyone can make informed decisions on what is right for their household, and paper towels might be right for you, and that's OK! I don't want to clean up dog puke either. I too washed diapers for my babies, so I'm quite familiar with my hands in a toilet! 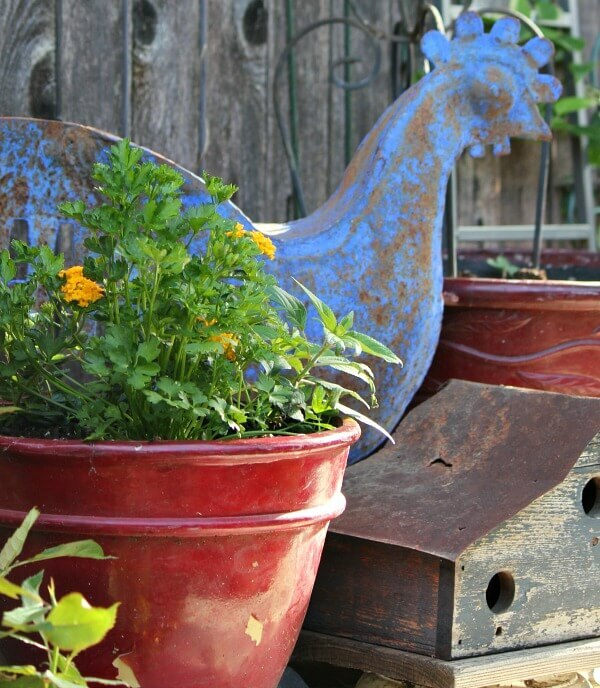 Have you tried sprinkling cayenne pepper on the soil in your containers? It only took a few times to break my pup from digging in my planters. I imagine it would work just the same to stop your pups from pooping in yours. I've heard black pepper works too. It didn't hurt my pup, just gave him a snorting, sneezing fit. I sprinkled lightly. I tried the pet version of cayenne pepper when they were pups, and it didn't work. Tried black pepper too and everything else on the market. Thank you Brenda for the toilet paper tip. I usually like Charmin, but will buy Cottonelle from now on. And yes it makes me so mad when that happens in a store, that is why I always look at my ticket before I leave the store now a days! Have a great weekend!! It truly did make a difference with the Cottonelle. And I'd been a Charmin buyer for many years. I will buy generic for many things, but not toilet paper! We seem to have lots of clothes that have bitten the dust–especially T-shirts and sweat pants with holes in them. I cut them into squares and use them instead of paper towels for lots of things. I just toss them when they're dirty, as I would with a paper towel. Re ice cream and dogs, my dad used to feed his dog ice cream. One spoon for Dad, one spoon for dog. My dogs get pancreatitis so easily I can't let one thing, one little tiny bit of food, fall to the floor. They have to have prescription food and treats. I've dealt with quite a few very expensive vet stays over that. Love your ideas. You may have mentioned this and I missed it – have you thought about planting a single square of grass sod in a rectangular container of some kind? 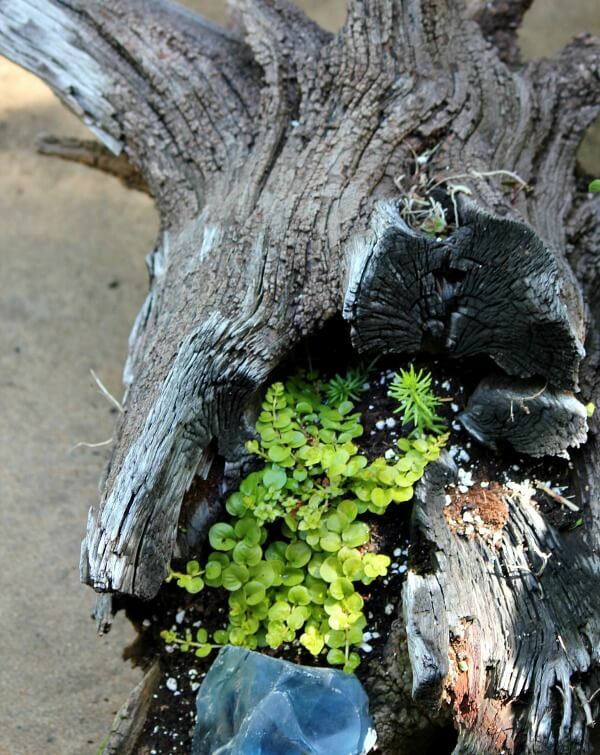 You would probably have to elevate it some to look similar to the other planters. Maybe they would like that? My dogs have never had grass except at the little blue house. In TX we lived in a garden home and it was deck and concrete. So I don't think it would make any difference. So they weren't trained to grass. 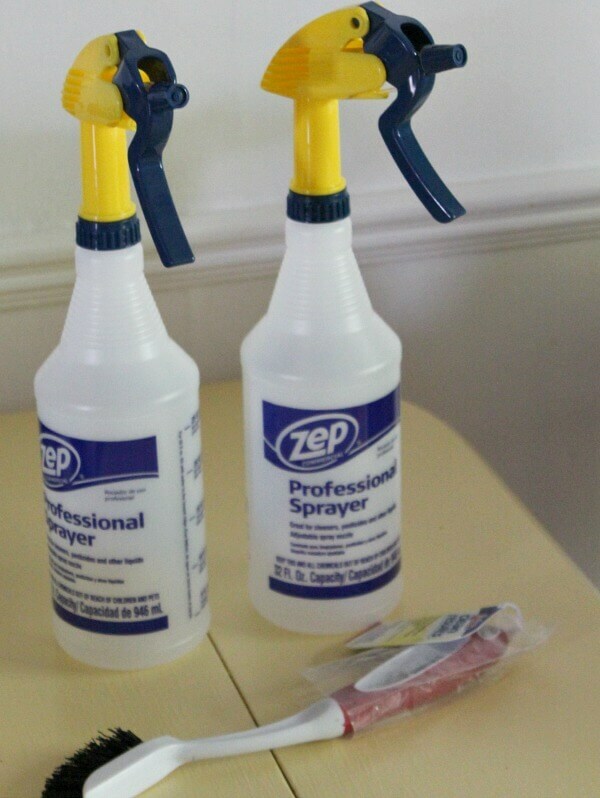 Just FYI on the spray bottles – they're only 99 cents at Walmart. Granted, they're not as heavy-duty looking as the ones you bought, but they work just fine. I have one for a homemade natural cleaning spray and the other I use for plant misting or to squirt bad kitties if they jump on the table! When we were in Walmart the other day, the greeter gave us a coupon for $10 off our next $50 online grocery order, so I'm definitely going to take advantage of that. We have a private well with municipal sewer, but not septic. A friend of mine has septic and she was told to only use one-ply TP. It never fails that I place a Walmart order and forget something. This time it was Benadryl for Abi's allergies and the spray bottles. I won't go into a Walmart store. I call it Hellmart. Goodness, I see myself all over this post and readers responses. My dad loved PF chocolate cake and mum would cut the slices an hour or so before dinner. Also, my dad, like francetaste's , would give the dog ice cream in the one for you one for me style too. Too funny. I always used Scotts because I was brought up to respect the plumbing. As I've gotten older, Scott's because a bit too rough for delicate female tissues. I bought Cottonelle and lived in mortal fear of some giant clog up just waiting to happen. Well, one day my bracelet fell into the toilet before flushing. So I got a wire hanger and went fishing. The Cottonelle had almost instantly dissolved into minuscule, non-clumping bits. You plumber did not lie. I use cottonelle too! but I didn't know that about charmin. I wonder if you got a couple of those whirley~gigs or whatever they're called now… and stuck them into the pot for awhile. until the puppies lost interest in that pot? maybe that would work. I don't think they would like the movement those make. it might be worth a try. and it wouldn't harm them or the birds or anything. I'm with you on the Pepperidge farm cakes. The sad thing is, my husband and I eat the whole cake, in one day….every time we open one! Last summer they went on sale for $2 each at my local grocery. I bought 10. It just so happened that Hurricane Matthew came along and we lost power for a week. Eat cake….we did!!! I love all their flavors, but coconut would be my favorite. Have you tried German chocolate? eyes when the pack of 8 toilet tissue had been rung up twice and also a three pack of paper towels. Those items were not listed one right after the other on the receipt, but there were several items between them . Each item showed on the receipt like I had bought two of them. This is a store where each item is rung up, it isn't just scanned. I'll be watching like a hawk at that particular store from now on, and will check the receipt before I leave at all stores. You struck a nerve with me about not receiving the sale price. I find this very annoying. As you and others pointed out we usually bought the item because it was on sale. Every item is scanned. Therefore there is no excuse for being charged the wrong price, it is a simple a matter of changing the price in the store computer. Therefore if I was over charged, everyone else who bought the item was over charged. The store is frauding many people. My Yorki mix, Dixie takes them. I saw the comment about your dogs never having a lot of grass in the past to get used to. I don't think it is so much the plants as it is them trying to keep cool or even bathe in the sun. My Layla loves to lay in my herb garden. The soil keeps her cool while the sun is something she loves. 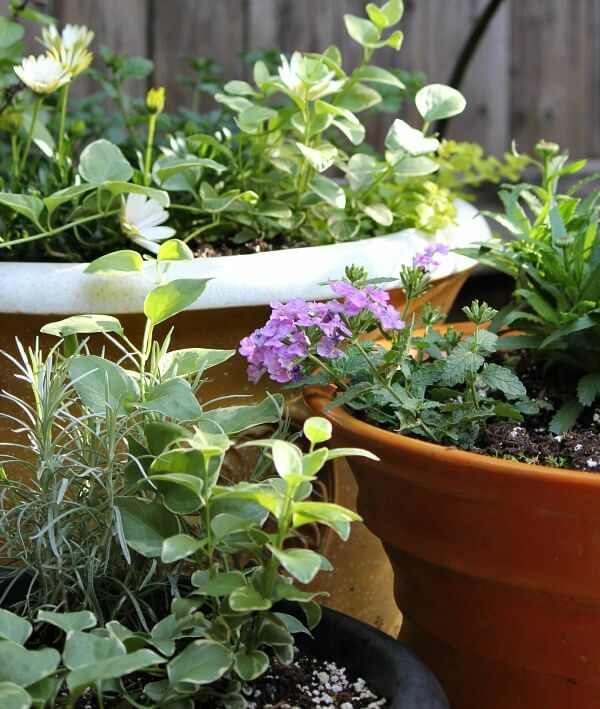 Maybe a pot of inexpensive herbs or ground cover in a pot? Entice her at first with one of her favorite treats. I am like a hawk watching the screen in the checkout line. I can ask if I got the sale price or see something suspicious. Like you, I hate customer service lines. I buy a lot of cleaning products at the Dollar stores. You can't beat cleaning and laundry supplies. Spray bottles from empty Windex or cleaning products are great recycles. They are well made as the manufacturer isn't going to skimp on a leaky product. Finally, no one likes a zillion stops, especially you with the bad ankle, but if you can find a Pepperidge Farm or Sara Lee outlet, you can stock up on your sweets for a great price. Thanks for your tips. Loved the conversation. Well, who knew? Cottonelle will be my next TP purchase! I used to always buy Northern but then I learned that the company is owned by the Koch brothers who are wealthy people here in Michigan who want to build another bridge to Canada which they would own and profit from thereby causing revenue from the Ambassador Bridge to decrease and the state to lose money. Anyway, then I started to buy various brands but haven't found one I like. So, thanks for the tip. 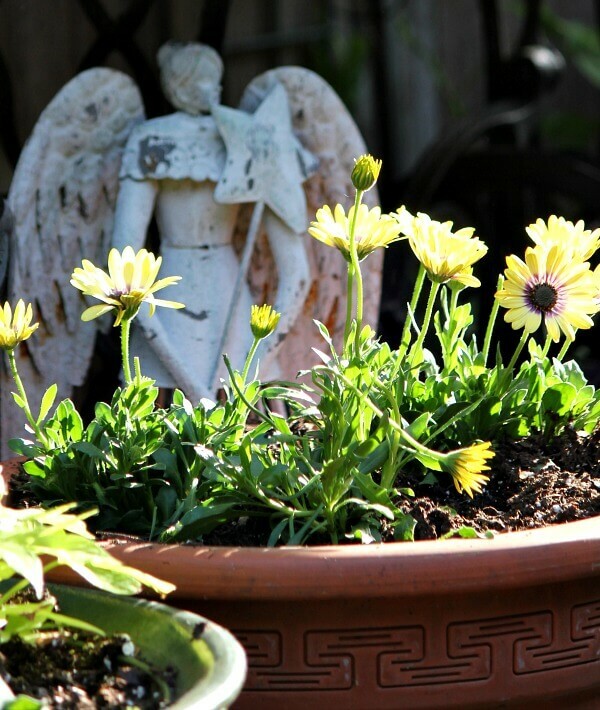 Brenda, I am seriously coveting your angel who is standing behind the yellow daisies. She is so sweet. She looks kind of vintage. Was she a lucky find? Your puppies sound quite fragile, health-wise. I know they aren't young puppies and I think they are so lucky to have you for a mommy. It sounds like you go to a lot of trouble to feed and care for them so they are healthy. But that is what us doggie moms do. When we adopt them it's like they really are our four-legged children and bring us so much joy. Especially if we live alone. I hope your pupsters stay happy and healthy for a long time. They are such cute little ones. Sorry you're having the pooping problem, though. Have you asked your vet if he/she has any ideas to stop the behavior? I'm with you about the paper towels. I know it is better for the environment to use something that you can launder and re-use, but I hate wiping up yukky stuff and then having it sit around until I have a decent-sized load to wash. I try not use a lot of paper towels, but I do use them. I am a recycler in many other ways, though, so maybe that off-sets the bad paper towel habit. We recently got a Walmart neighborhood market and I love it! So quick and easy to shop for groceries. Closer than the regular large super Walmart, too.